Here's another example of the results of my ongoing Stash-Down. It was raining so much it Toronto the day I finished this, that I struggled to get any photos at all. The sun came out for a few minutes so I started snapping. You can see the light changing fast in these. By the time I turned the mannequin around to do the back it was so dark I'm not bothering to include those shots. There won't be a pattern for this one but if you would like to create something like it first read this post for the tips and tricks. The sweater was worked top down so I could add in yarn if I needed to. I didn't. 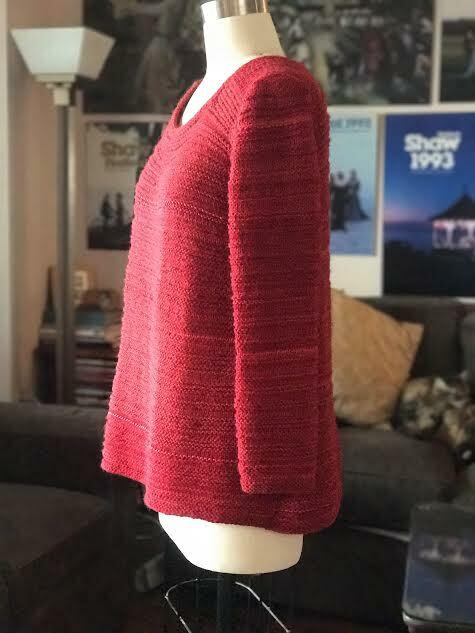 I did the sleeves bottom up because by then I realized I had more than enough yarn. In this case all the yarn is red, however the reds vary and I have multiple weights and fibres. 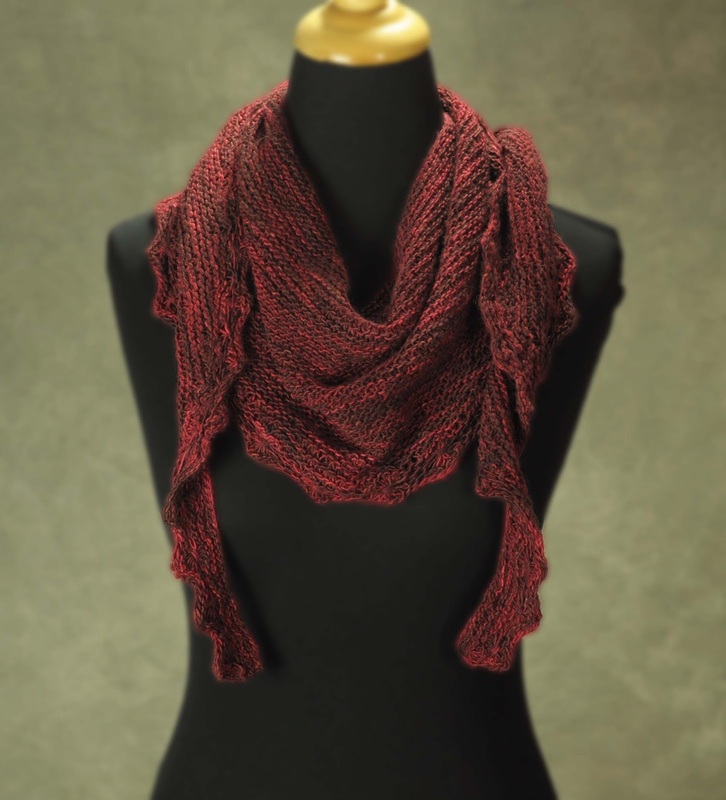 Everything from lace to worsted weight as well as cashmere, silk, wool, and rayon to name just a few. The worsted was some Cascade 220 purchased for a hat and scarf but unused and some Knit Picks which came to me by way of another friend's stash down. Some are leftovers from other projects and were of very small amounts. Do a swatch to define a gauge when mixing weights together. I used the needle size which I would normally use for a worsted yarn. 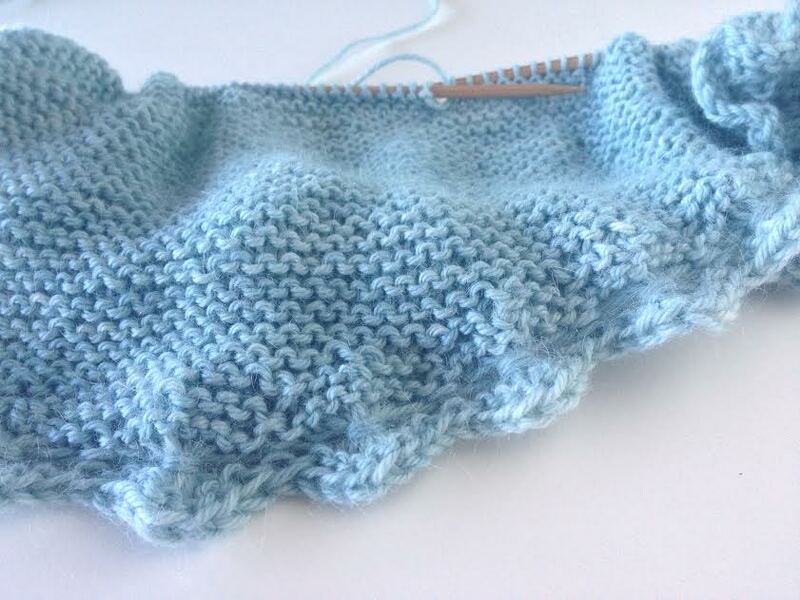 I did the knit one row in each of three yarns trick and repeat. 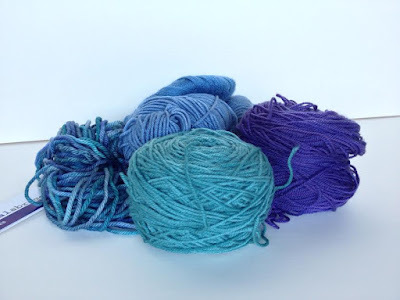 (Make sure the weights of the three yarns are all different.) Then I changed out yarns a few times. Make a bigger than 4 inch swatch. Block it. 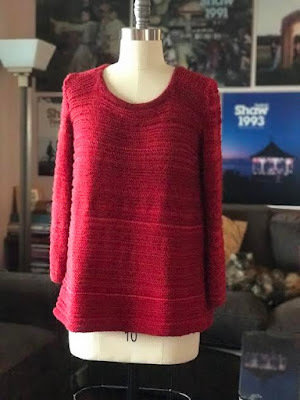 Pick a simple top down sweater which matches the gauge. Start knitting. Recently one of my friends found out I mix yarn bases and told me I was scaring her. Don't be scared! This works because each yarn is used in one row at a time. You can mix as long as you don't do any large areas in a single weight. If you do, it will revert to it's normal gauge. The fabric will drape. 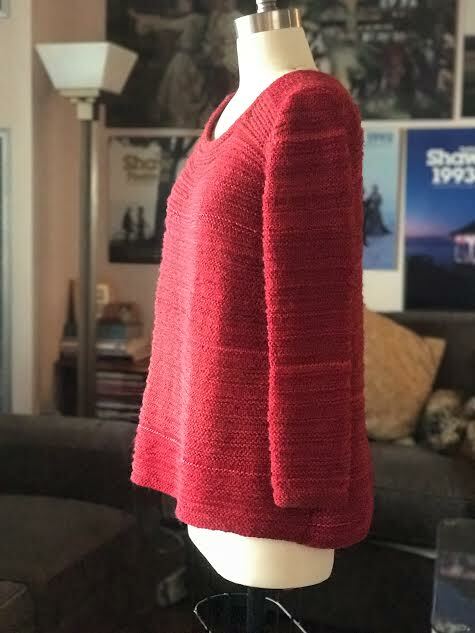 The hand is more like a silk or cashmere blend even though about 70% of what I used is 100% wool. 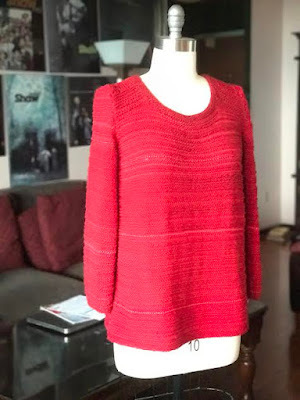 I knit the length to about 3/4's of what I wanted before the band and then I put it on my mannequin for about 48 hours. I had to take it off and do the neckline part way because it was stretching out too much to be sure about the overall length. Once I knit the neckband I got a much more accurate length. The armholes also looked a little sloppy but after I did the neckline I realized the sleeve seams were going to take care of them as well. I did a saddle shoulder which may have added to the stretch there. I did all the edges in one of the worsted weight yarns for consistency. I'm still picking away at my stash-down project. It's moving along slowly between my pattern development projects. I haven't got a firm timeline in mind but I have realized that the focus has resulted in a stash-less policy which I didn't specifically put in place. 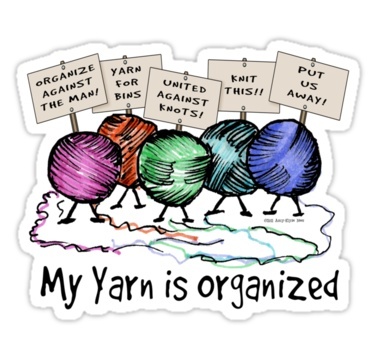 I've not made a single purchase from the yarn vendors who are often at my monthly guild meetings. I've also stopped buying the raffle tickets since the prize is so often yarn. I've been in yarn shops without buying as well. It's funny how one word can have such a big impact on one's strategy. At the last guild meeting I sat beside a friend who has been doing both stash-down and stash-less for at least a year. We discussed the problem of all those single skeins we buy from hand dyers which are often not enough for a project. It means buying more to make use of what you have, if there isn't a good companion yarn already in stash. As you know from a previous post I have two patterns to address the blending of different yarn scenario. I've just come across a blog series on stash which I would like to share with you. There are 17 extremely insightful posts on the topic here. They are written by Felicia, creator of The Craft Sessions. 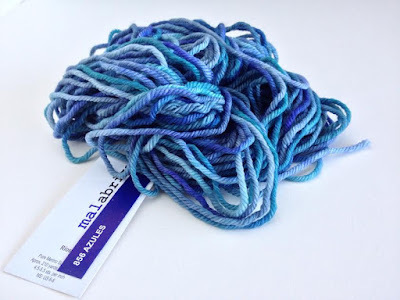 Her stash includes both yarn and fabric but her journey of discovery applies to all stash or hoarding. I hate to use that word but saying it to myself has had a positive impact on my behaviour. It seems the word stash sounds more innocent to my ears. The series runs from Oct 2014 to Sept 2015 and reflects her changing thinking throughout. I especially liked the post on restrictions and the one on desire. I've read widely in the area of positive psychology. When I first came across the idea that desire is actually a stress it was a light bulb moment for me. Even bigger is accepting that fulfillment of the desire doesn't lead to happiness! Take a look and let me know what you think.